Homemade soup is great for anyone who wants a quick and easy lunch or dinner but wants to control what goes into it. Making your own is also a great way to use up leftover veg or bulk cook for a family. The hassle of making it from scratch may put you off, though. From peeling and preparing and boiling the vegetables to blending them and straining it all, it seems it would be much easier just to open a tin. However, soup makers will do a lot of the hard work for you and just how you want it, too. In the winter months, it has never been easier to make your favourite flavour. The best we reviewed in terms of control, possibilities, ease of cleaning and the help you get along the way, the Morphy Richards Total Control is well worth that little bit extra money. A lot of other soup makers, as you will see, have quite a strict portion control. However, thanks to the portion control feature, you can select whether you want to make enough for two, three or four people. No waste, and plenty to go around. Then, select your desired consistency and sit back and let the hard work be done for you. It will get to work with all of the contents, and for the correct amount of time too. As it has a touchscreen display, it is easy to select the exact settings you want with no effort. There are a huge nine settings – smooth, medium and chunky soup settings, saute, drinks, re-heat, blend and pre-clean. We particularly love the reheat option so you can work your dinner around your schedule without ruining the taste. As for the pre-clean feature, simply fill it with some water and washing up liquid to cut down on the time you need to spend standing over the kitchen sink. The stainless steel insert is also removable from the plastic outer, for a full clean when needed. The Morphy Richards Total Control tops our list for the sheer flexibility and options it gives you. It really does live up to its name. Smart Response technology also keeps everything in check, which will assist the complete cooking newbies. For the price, you get a lot for your money compared to the models which retail for £10/£20 cheaper, so it is most definitely worth it. Tops the list for control, cleaning, and capability. If you want the best of the best, then paying any less for a cheaper model is pointless. Fully versatile and making light work of soups, smoothies and purees, this VonShef model is easy to use and has a great capacity for all the family. There are four modes to choose from on the control panel. Smooth soup, chunky soup, blend and pulse all provide different results and do so very effectively. It brings all of the ingredients up to the required temperature and simmers them until ready. On the jug, there are two markers; one for hot liquids and one for cold. This helps you to get the correct level of ingredients for the perfect consistency. Regarding safety, there is a special cut off if the jug is too full or empty. This prevents it drying or overflowing which could both cause faults. There is also a thermal cut out if it overheats so it can be left alone without you worrying. A 900W motor heats and blends the ingredients simultaneously which results in a faster soup without any loss of quality. It can be ready in about 25 minutes which is fab for those last-minute dinners or lunches. There is still the risk of ingredients sticking, so a little splash of olive oil or butter in the bottom will prevent this. There is no countdown, but there is a little thermometer so you can check everything is up to temperature. A little alarm sounds when it is all ready. A great price, user interface and enough power to handle whatever ingredients you throw at it - and we loved that you can see it all in action. One of the cheapest options on our list, this offering from Salter gives you soup in just 20 minutes, and there is a choice of three blend settings. It does what it says on the tin, without the fancy extras which come at a premium price. Choose one of the settings, and leave it until it is ready. There is a little light to let you know it is on, and all you need to do is press ‘mode’ until the right one is selected. The blender is attached to the lid, so it is relatively easy to clean and maintain. It is also lightweight, so you can carry it into the dining room for serving thanks to the pouring spout. The minimum amount you can make is one litre, which will do you a few times or is enough for a small family. As it is stainless steel, it will retain the heat for a little while until you want to serve it, or just leave the lid off so it cools a bit quicker and it can be frozen. We will say it is better for completely blended soup rather than chunky soup. With the latter, there seemed to be some sticking to the bottom of the jug, and it didn’t leave large chunks in the soup, just chopped up pieces. It is also a bit bulky so can be hard to grip compared to the other models, but for the price, they are issues which we don’t think should put you off. It is compact and does the job sufficiently. For the price, it would be a great every-so-often addition to any kitchen. Morphy Richards are the leaders of the soup maker world, and this particular model has been designed with maximum flavour in mind. Thanks to the dedicated saute setting, you can add onions, bacon, garlic or other spices to the jug before adding the stock and extra ingredients for more flavour without the hassle of preparing them separately. The smooth setting will prepare your soup in around 21 minutes, and the chunky in 28 minutes. If it is a bit too thick still, just press the Blend button until it is to your taste. One downfall of some other models is that you can’t easily open the lid and check on how things are going, or add ingredients at a later time. Perhaps you want to add some lentils in the last few minutes, but have to do this manually with your current method. However, with the Saute and Soup, you can pause it, add your extras and then it will remember where it was. There are 17 recipes included in the booklet which comes with the purchase, covering everything from traditional soups to smoothies and milkshakes. A detachable power lead will let you carry it and serve at the table, and up to four servings can be prepared at any one time. An LED screen gives you a countdown, and the buttons are large and clear to read for anyone who usually finds that difficult. There are slightly cheaper models out there, but in terms of versatility and effectiveness, you can’t get much better. The saute function could be improved though – you still have to stand over it and constantly stir, so it doesn’t necessarily make life easier, but just reduces the amount of washing up afterwards. 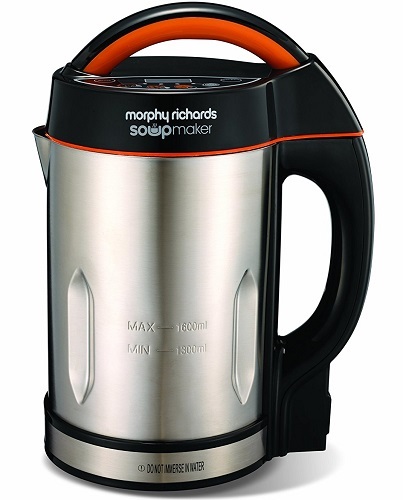 A longstanding favourite among fans of both soup makers and the brand, this Morphy Richards gives you just enough control without risking hampering its job. Complete with plenty of settings which should see you through, the Tefal Easy Soup is a great option for anyone who wants to make life as easy as possible. There are five automatic programmes, so you don’t have to fiddle about with settings and timers. A smooth soup can be ready in 23 minutes or chunky in 25, and it also has the ability to prepare compotes and smoothies in under half an hour. It beeps three times to let you know everything is ready, and it will keep the contents warm at the press of a button if necessary until you’re ready to serve, for up to 40 minutes. The stainless steel material also keeps it warm thanks to insulation. There is also an Easy Clean button, which will be welcome to anyone who hates how fiddly cleaning jugs and electricals can usually be. Just fill the jug with plain water, and in three minutes, it will be sparkling again. This doesn’t work perfectly, but certainly reduces the need for scrubbing. The beauty of a soup maker is that you know what is going into your creation from scratch, but if you need a bit of inspiration, there is a recipe book included which contains 30 unique ideas, from traditional soups to gazpachos and drinks. It doesn’t cost much more than other models, but the ease of use and cleaning is miles ahead. Definitely worth the price. There are plenty of handy extra features which mean that this soup maker will be a great addition to your kitchen all year round. In as little as 21 minutes, this Morphy Richards soup maker can make a fresh batch of soup to your exact taste and consistency. The 1.6L capacity is plenty for around six people, so great if you’re planning a family meal or want to plan ahead for your lunches. It has been designed so it is easy to use too, requiring little effort from you. Just chop and prepare your vegetables, pop them in the maker and choose the smooth or chunky setting. It won’t work until the lid is properly clicked in place, which is a good safety element. Everything is easy to navigate thanks to the simple interface, which has an LED countdown display. The buttons are clear, and a little illuminated light comes on when it is in operation, so you know what has been selected. Don’t think that this soup maker will be destined for the very depths of the kitchen cupboards over the summer months. It can make smoothies, juices, milkshakes and even some curry sauces, so there is no denying you’ll get plenty of use out of it. Because of the heat, food does get a bit stuck onto the bottom if you don’t put enough water in the bottom firstly. This can be difficult to get off, but if you keep an eye on it all and follow the instructions, then this is unlikely to happen. Concerning price and ease of use, it is one of the best available and perfect for anybody who doesn’t want to be spending hours messing about with settings. There is also a little recipe booklet included which is great for any newbies. Most of the brilliant features of the more expensive Total Control model, but just in a less fancy presentation. For half the price, it is worth a shot. If you want a soup maker to have more control over your diet and up your vegetable intake, then this model from Weight Watchers will catch your eye. It has everything which features in the other models, from four blend settings to the usual safety control measures. This lets you leave it to run without constant hawk-eye monitoring. There is also an auto-clean function which will tackle any left-behind food. This makes it easier for you to look after. Should you need a bit of inspiration, there is a little selection of Weight Watchers recipes provided. It includes all of the usual favourites, but there is plenty of nutritional information too the Smart Points valuation alongside. It is a really good price for what you get, and there is a pouring spout and easy to hold handles, so control is high. Everything is kept basic, which is perfect if you prioritise life over cooking and need something easy. Soup makers are great for helping you control what you eat, and even though there are slightly better soup makers out there, the support and additional recipes you get will sway you if this is your primary concern and reasoning. Our budget pick, this soup maker is simple yet does everything you could possibly want, keeping everything basic and easy to navigate. A digital control panel lets you choose from a smooth, chunky or blend setting so you get the desired consistency, and can leave it to work until you are ready for it. It takes around 25 minutes to complete, and the end soup is what we found to be the perfect temperature for enjoying straight away without having to cool or give it an extra boost. There is also an auto-clean setting, which seems to work pretty well and reduces the need for manual scrubbing. Like you get with some more expensive models, there is no saute function, so this will have to be done beforehand separately. We also found it was not great at coping with harder root vegetables such as parsnips or potatoes compared to softer ones, so these would have to be kept small or pre-boiled. But this isn’t an issue particularly unique to this appliance, so it isn’t something which should put you off – just adapt your recipes or method slightly. There are the usual safety precautions such as dry protect and overfill prevention. Don’t be put off by the fact it isn’t a well-known brand; it still performs as well as the big guns. 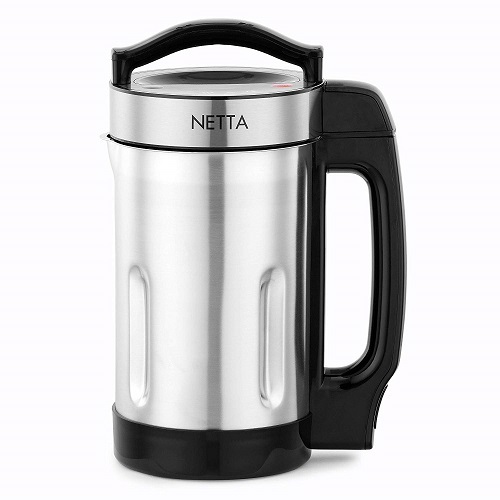 If all of the preparation and sauteing/pre-boiling doesn't bother you and you simply want something that will create the soup, then this Netta model is up to the job and just as great as some twice the price. With plenty of flexible options to help you prepare your soup just as you want it, this Lakeland model is great for anyone who is picky. The touchscreen display lets you select a range of settings, and you can cut, blend, cook, simmer and stir all in one. The temperature can be set from 75 to 100°C, and there are 3 blend speeds so you can either have a completely smooth consistency or leave it quite chunky and the vegetables prominent. There is a countdown timer, so you know how long you have to go, and alerts can give you an update when it stirs, is finished or is keeping warm, so you know how it is going. You can set it anywhere up to 60 minutes, which will give you a perfectly smooth consistency. For the summer months, the ice setting will blend the contents without creating heat, or crush smaller cubes for cocktails and cold drinks. Ideal for smoothies, dips, baby food or milkshakes, so you don’t have to store it away when soup is the last thing you could imagine eating. Thanks to the auto-clean setting and non-stick plate, looking after the appliance between uses is made easier. It isn’t perfect but reduces the need for scrubbing and soaking. You also get a cleaning brush included which reaches right to the bottom and under the blade. As it is a glass jug, you can see how the soup is coming along. This is heavy duty, so there’s no need to worry about things being too hot for it to cope. It also works in short bursts of mixing, so you can stop it if it reaches the right consistency. You may be debating over it because of the price tag, but the little helpful extras and specifications will make your life easier. If you’re a regular soup maker, it will be worth it. The price reflects the quality - one of the strongest blender-type soup makers available. Perhaps one of the most flexible of the appliances on this list, this soup maker from Cuisinart will cover chunky or smooth soups. It doesn’t stop there either, with jams, sauces, curries and even risottos also on the list. It will saute on your behalf, so there is no need for extra pans and washing up. The non-stick cooking plate will reduce the likelihood of it all sticking, and the element cooks all vegetables perfectly, from broccoli and cauliflower to parsnip and potatoes. There are four blend speeds and a pulse to get the correct consistency, and high/low/simmer settings for the correct heat, which is why risottos are just as easy to prepare as sauteing. The glass jar lets you view the contents as it gets to work so that you can make any necessary changes during the cycle. You can also add any last-minute or extra ingredients during the process, without interrupting it and causing it to restart. An audible beep at the end of the cooking cycle will let you know when it is all ready, and the triple seal lid will prevent all the contents from escaping and also cut down on excess steam. Because the blades are on the bottom plate rather than the lid, it is possible to make smaller quantities than with other makers which will suit anybody who likes to make individual batches. It looks like an ordinary blender which is nice if it will be on display and is easy to clean – just follow the instructions and fill with water and give it a blend. For what you get, the price is pretty good and definitely worth paying for anyone who will be using it regularly. For a soup maker which also does well as a general blender, this offering from Cuisinart is going to be one of the best you can buy. Soup makers start at around £40 for the more basic models which will create your soup but require a bit of preparation first, and reach over £150 for the more substantial models which can blend other foods such as smoothies and sauces, and even saute vegetables or clean themselves. Always follow the instructions for your particular model, as the methods for one may not be appropriate for another. As a general rule, you should try to keep vegetables a regular size and all similar in size for more even cooking. You should also add water to the pot first, which will prevent any ingredients from sticking to the bottom and burning. Some models may also recommend adding a splash of non-stick oil or some butter. What Is The Difference Between A Soup Maker And Blender? Firstly, a soup maker such as one of those featured above is seen as a one-stop appliance for preparing soup, whereas a blender which is more for smoothies and does not heat the contents would involve heating the soup after it is mixed. Essentially, dedicated kettle soup makers can heat soup in around half an hour on average using the hotplate at the bottom of the jug, whereas blenders generally use the heat created by the rotating blades to generate some warmth and don’t cook the contents as well. However, there are two forms of soup maker – kettle and blender. The general difference between these is that the blade of the latter is on the base as opposed to the lid, and they are usually glass so you can see the contents, but the end result is pretty similar. A blender soup maker will create heat, unlike an ordinary blender. Therefore, there are some ingredients which wouldn’t be appropriate to put in a blender without cooking or sauteing beforehand, such as onion and other vegetables you wouldn’t eat raw. Soup makers can often cook or saute some vegetables beforehand and then you can add the other ingredients. You will still have to do a bit of preparation, such as cooking meat or chopping the ingredients, but there will be considerably less. Which Brands Make The Best Soup Makers? Morphy Richards is the leader, with several different models available on the market, ranging from budget to the more complicated and adventurous. The next is Tefal, who do not have as many options available but are still a heavyweight. Other names you may see are Salter, Cuisinart, Lakeland, Tower, Daewoo and VonShef. Less well-known brands also have models on the market, which are usually basic but affordable, such as Cooks Professional, Duronic, Waring and Berg. Brands mostly associated with ordinary blenders and smoothie makers, such as NutriBullet, also have soup makers available but they work more like blenders as opposed to dedicated cooking soup makers, which is why they do not feature on this list. Which Soup Maker Is Best For Me? Think about the capacity, ease of use and how well it could cope with the kinds of soup you would regularly be making. For preparing around four servings, a capacity of at least 1.6L would be ideal. If you want to make single servings at any one time, one closer to 1 L may be best, as well as a model with the blades on the lower plate as opposed to the lid, so all the contents are blended. In terms of the interface, have a look at the pictures and see which you think you could cope with best. Most are a simple press of one or two buttons to choose the setting, but others may involve dials. The majority can make around three different consistencies, between completely blended and smooth to chunky with a country soup feel. Most are great at the former but may struggle with the latter, so if you’re more of a stew person than a carrot and coriander, pick one which seems good for leaving the vegetables in one piece. Do I Need A Saute Function? If you regularly add onions, fresh herbs and spices or meat such as bacon to your recipes, a saute option may appeal as it will reduce the need to fry these off in a pan beforehand. The overall aim of this is to add a bit more flavour to the soups, and our tests showed that this is indeed the case with sauteing soup makers. Models with the ability to do this are often a bit more expensive than the basic models, but for an extra £20 or £30, we would say it is worth it if you think you’ll make use.